Rebuild a Thriving Environment with the Cast of Ice Age! It’s time to rewind the clock and take a trip back to the ice age. Join Sid, Manny, Diego, Scrat and the rest of the herd in yet another adventure out in the frozen tundra. Shape the world of Ice Age in your own image, populate it with the animals and characters that you want, and design every facet of life in this brave new world. The slate of ice has been wiped clean, so take care when you set out to leave your mark on it. The world may be encased in a perpetual sheet of ice, but things could not have been better for the animals of the ice age. Everyone has a home, everyone is happy, and everyone has ample opportunity to sloth around, even the ones that aren’t sloths. Unfortunately, that is all about to end; there have been an increasing number of tremors, avalanches and cracks appearing in the ice, all of which have been destroying everyone’s homes. It’s not because Manny’s been putting on weight either; it turns out that in his never-ending quest to find a safe place to bury that acorn, that screwy saber-toothed squirrel, Scrat, irreversibly destroyed the glacier holding everything together. Things are looking grim for the animals, and it will be up to Sid, Manny, Diego and Ellie to fix it all over again. The new ice age is yours to control! Everything about it, from the “buildings” it will contain to its overall look and layout, is literally at your fingertips. However, you have to choose wisely in how you rebuild it; even the ice age doesn’t have free handouts. Everything costs its weight in coins and it will be up to you to decide how best to spend them. Give your village whatever name you deem worthy. Set up homes for all the various creatures, including lodges for the beavers, huts for the sloths, and so on. Add extra fun stuff for the animals to partake in. Set up a climbing wall, build a volcano, create a free-falling simulator, and more. Clear out drifts of snow to free up space where you can build more things on. Add some spice to your ice age by putting in dozens of decorations. Plant trees, imprint footprints into the snow, build snow sculptures, carve out paths, and so on. Earn experience as you play and level up over time. Higher levels unlock even more interesting things to build. Acquire rare acorns and use them to either speed up the construction process or to acquire rarer animals. You might have a hand in designing how the new ice age will look, but even it will lose its charm if it doesn’t have a handy menagerie of critters to literally breathe some life into it. Fill your village up with all sorts of creatures from the films, including sloths, beavers, beaky birdies, hedgehogs, smilodons, mammoths and even dinosaurs! Make sure no one’s lonely by giving them a good family. Give every home a guy and a girl and watch them raise some kids. 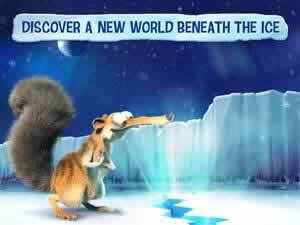 Be on the lookout for Scrat’s mischief. He might appear on your screen looking for a place to bury his acorn. Give him a tap to chase him away and grab some extra coins. There’s more to Ice Age Village than just building and populating a village. There are all sorts of fun little distractions you can engage in to pass the time and earn extra money. Help Scrat swipe at jumping piranhas. Rub eggs and keep them warm to hatch some adorable little babies. Build a movie theater to watch a unique and hilarious short starring Scrat the squirrel. By traveling fourth dimensionally, scientists have discovered a way to see and visit alternate timelines. In Ice Age Village, you can go online to check out the villages other players have made and find even more opportunities to earn precious coins. 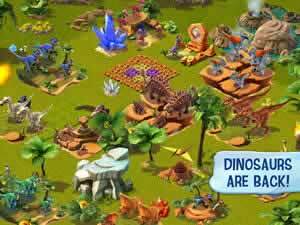 Connect to Facebook and quickly find other Ice Age Village players. Check out other players’ village and get a free preview of what you could add to your own. Make a list of friends. Send them hearts and gifts to increase your reputation and earn more coins and acorns. See if you can find Scrat tuckered away somewhere. Dig him up to earn a nice bonus in coins! What else is there to say? Anyone who’s a fan of the Ice Age series of films will likely find a lot to like in Ice Age Village. It brings back all of the franchise’s humor and charm. It provides a good outlet to exercise your creativity anytime and anywhere. Most of all, it adds a few new twists to the city-building formula by implementing many zoo manager aspects as well. 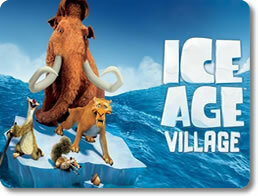 Prepare yourself for the next ice age with Ice Age Village!